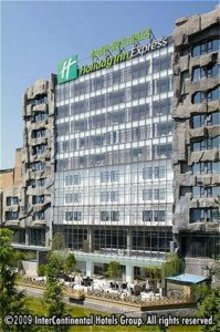 Holiday Inn Express Beijing Minzuyuan sit in the best developed district of Beijing - Olympic Business District. Walking distance to the Bird Nest and National International Conference Centre, partial of the rooms are having great view of Bird Nest and Water Cube, partial of the rooms are having amazing view of Minzuyuan Park. Easy access to CBD, ZhongGuanCun Hi-tech Development Zone, Lufthansa Commercial Centre, 5 mins to Beijing Int'l Conference Centre and 18 mins drive to the New China International Exhibition Centre. Various transportation convenience either for business travellers or leisure stay. Subway line 10 station is just next door. 25 mins to Beijing Int'l Airport. Hotel provides you a simplicity, youthful, refresh and comfortable stay experience. It is the only international hotel sit in Olympic Village provides you the fine and simplicity product with the best rate, all rate are inclusive breakfast, high speed internet access, WiFi. Choice of SmartStay.